IBPS Clerk CRP VIII Notification 2018 – Dear Applicants, Institute of Banking Personnel Selection has released advertisement for filling up 7275 Clerk Vacancy. Candidates those are interested and fulfill eligibility criteria may apply online for IBPS Clerk Recruitment 2018. Candidates those are completed their Graduation may apply online either here or official site. 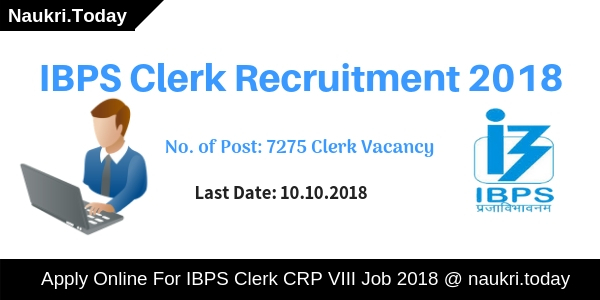 Aspirants can fill their IBPS Clerk CRP VIII Vacancy Application Form from 18.09.2018. The tentative last date of online registration is 10.10.2018. Here in the below section, we mention all information regarding IBPS Clerk Job Notification 2018. Institute of Banking Personnel Selection is inviting online application form for filling up 7275 clerk vacancy. This is a great opportunity for candidates those are searching job in banking sector. IBPS every year conduct clerk examination for filling up vacancies in various banks. So, applicants, those are interested IBPS Clerk Vacancy may apply online from 18.09.2018 to 10.10.2018. IBPS Clerk 2018 Exam will be going to held on 08th, 09th 15th & 16th December 2018. Furthermore, like eligibility criteria, application fees, How to Apply for IBPS Clerk CRP VIII Recruitment 2018? & others you can get through below paragraphs. Latest News as on 09.10.2018: IBPS Clerk CRP VIII Online Application is available till 10th October 2018. Those applicants are going to participate in the examination must fill the online application form successfully. Through direct official link you can apply for IBPS Clerk Recruitment 2018. The direct link is available at the end of the article. Latest News as on 06.10.2018: Dear Candidates, Institute of Banking Personnel Selection Clerk VIII online registration is started on today. Those applicants are interested and eligible for IBPS Clerk Recruitment 2018 may apply through online mode from the below link. 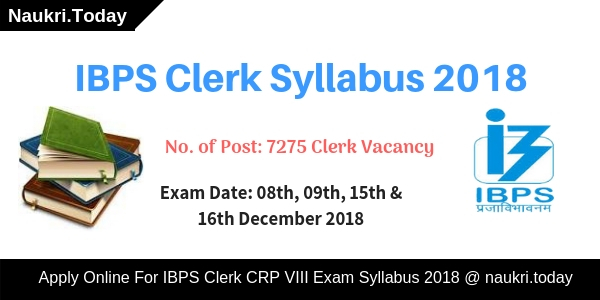 Important Dates of IBPS Clerk Vacancy 2018 – What is the Last date of Apply Online For Clerk CRP VIII Job 2018? What is the Age Criteria For IBPS Clerk Recruitment 2017 – 18 ? How Much Application Fee Paid for Applying IBPS Clerk Vacancy Application Form ? Applicants those wish to apply for 7275 clerk vacancy must fulfill eligibility criteria. Before apply online for IBPS Clerk Recruitment 2018 must ensure that they are eligible or not. It includes details of education qualification, age limit and other information. Applicants must have Graduation Degree in any discipline from recognized university. Candidates should have certificate/Degree/Diploma from the recognized institute. Furthermore, information you can check from IBPS Clerk Notification 2018. The age criteria is decided as on 01.09.2018. Applicants should not be less than 20 years for IBPS Clerk Recruitment 2018. The maximum age is required 28 years. Maximum age relaxation is applicable as per govt. norms. Selection will select for IBPS Clerk Recruitment according to the written examination. There will be two examinations: Preliminary Examination and Main Examination. For every wrong answer, 0.25 will be deducted in both examinations as a penalty. Preliminary Examination: There will be 100 questions and each question carry equal 01 marks. Total duration of examination will be 60 minutes. Subjects are English Language, Numerical Ability, Reasoning Ability. Main Examination: In this, there will be 190 question which carries 200 Marks. The duration of the examination will be 160 minutes. Subject covered are General/Financial Awareness/General English/Reasoning Ability & Computer Aptitude and Quantitative Aptitude. Furthermore, information you can check IBPS Clerk 2018 Exam Syllabus. Candidates those are apply for IBPS Clerk Recruitment also require to pay application fees also. The date of submission application fees is 18.09.2018 to 10.10.2018. Fees will paid through online mode only. After the selection of applicants, they will also receive an attractive salary. As per govt. pay scale criteria they will get their salary. Check official IBPS Clerk Notification carefully for more details regarding pay scale. Applicants those have successfully filled the online application form are eligible to attend the preliminary examination. The exam will organize on 08th, 09th, 15th & 16th December 2018. As per exam point of view, IBPS Clerk 2018 Exam Call Letter is an important document. Without it, candidates can’t enter in the examination hall. So must download their admit card from here on November 2018. For more details visit here on regular basis. After examination, candidates should check their IBPS Clerk Prelims Result from here. The result will release on either December 2018 or January 2019. For more related dates check IBPS Clerk Recruitment Notification 2018. Minimum qualifying marks secured as cut off marks. According to no. of participants, the cut off marks made by the department. Candidates must require minimum qualified marks to qualify the examination. It will release after the examination. So candidates must check their IBPS Prelims Exam Cut Off Marks also from here. Interested and eligible candidates may apply through online mode only. Before going to apply online applicants must keep require documents and information. Candidates must have valid email id and mobile no. for registration. After that, you must scan photograph and signature for IBPS Clerk Vacancy 2018. now you are ready to fill up the online form of IBPS Clerk Job 2018. First of all, go to official site ibps.in. Download IBPS Clerk CRP VIII Notification 2018. Now go to apply online for IBPS Clerk 2018 Recruitment. You will get a unique registration no. and password on either your mail id or mobile no. Fill other remaining information on your IBPS Clerk Online Form 2018. Upload signature and photograph on your application form. Now submit IBPS Clerk Application Form with all correct information. Conclusion: Institute of Banking Personnel Selection has released an advertisement for filling up 7275 Clerk Posts. Applicants those are eligible for IBPS Clerk Recruitment 2018 may apply through online mode only. The online registration form is available from 18.09.2018 to 10.10.2018. Dear Applicants, Are you Waiting for IBPS Clerk Notification 2017 ??? If yes, then here is good news for you. 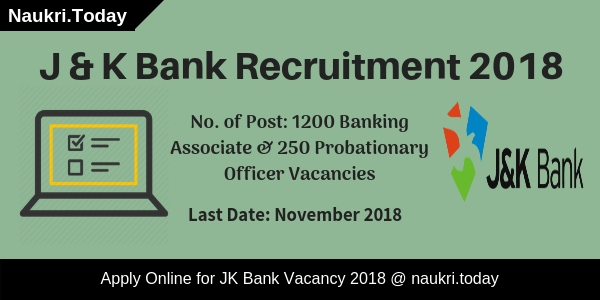 Institute of Banking Personnel Selection has recently issued notification of IBPS Clerk Recruitment for 7883 Vacancies. Interested applicants in IBPS Clerical Vacancies can fill online application form here before the last date. You can fill online registration form for IBPS Recruitment from 12.09.2017 to 03.10.2017. More information related to Eligibility Criteria, Examination Date & How to Fill CWE Clerk Application form etc. is mention in below article. Institute of Banking Personnel Selection has released recruitment notification of 7883 Clerk Vacancy. Applicants who are searching for IBPS Clerk Notification, this is great opportunity for them to fill online application form. If you are going to apply online form for IBPS Clerk Vacancy 2017 then first Check “What is the Required Qualification for IBPS Vacancy 2017” From here. rest of the information you can get from below para. Candidates who are going to fill online form for IBPS Clerical Vacancy must have done Graduation Degree in any stream or Higher Qualification from any recognized University. Applicants can check more information related to Education Qualification you can check from official IBPS Clerk VII Notification. Minimum age of the candidates for filling IBPS Clerk Online form should be 20 years & Upper age must be 28 years as on 01.09.2017. relaxation in age for IBPS Clerk Notification is applicable as per Department Norms which is mention below. General Category : This category candidates must paid Rs. 600/- as application fee for IBPS Clerk Jobs 2017. SC/ST/PWD/ESM Category : Rs. 100/- need to pay an application fee for Clerical CWE Vacancy. Selected candidates for IBPS Clerk Recruitment 2017 – 18 will paid as per Department normalization. You can check monthly salary of Clerical Vacancy from official notification, which is mention below. Firstly, candidates log on to the official website www.ibps.in. 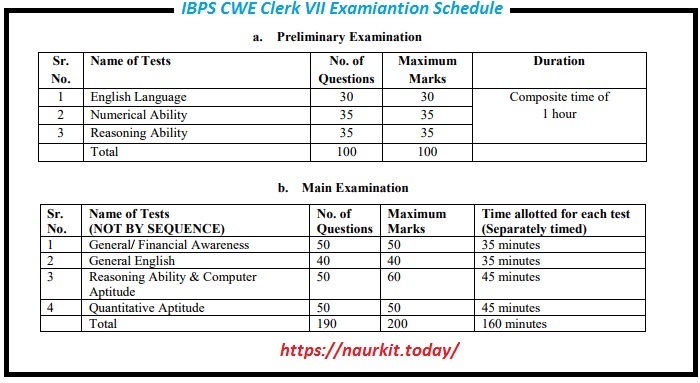 Now Click on CWE Clerical >>> IBPS CWE Clerk VII Notification link. Fill all recruitment information in form properly. Then upload your recent passport size Photo & signature in form carefully. Now deposit application fee & click on submit online form. Take print out of IBPS Admit Card for future use. Conclusion : – IBPS Clerk Recruitment 2017 – 18 Apply Online form for 7883 Vacancies. Eligible applicants can submit online application form for IBPS Vacancy 2017 on or before the last date, that is 03.10.2017.